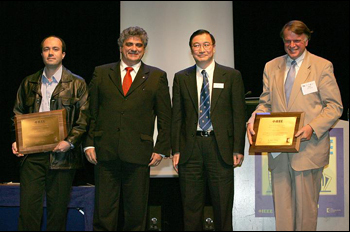 At the ICC 2007 Awards Ceremony are (left to right) Dr. George Theodorakopoulos, Dr. Roberto de Marca (chair of the Awards Committee of the IEEE ComSoc), Dr. Nim Cheung (President of the IEEE ComSoc) and Dr. John Baras. Ph.D. candidate George Theodorakopoulos and his advisor, Professor John Baras (ECE/ISR), were selected as winners of the 2007 IEEE Communications Society (ComSoc) Leonard G. Abraham Prize in Communication Systems for their paper: "On Trust Models and Trust Evaluation Metrics for Ad Hoc Networks," IEEE J. Selected Areas in Communications, Vol. 24, No. 2, pp. 318-328, Feb. 2006. The awards ceremony was held June 25, 2007, at the 2007 International Conference in Communications (ICC 2007), in Glasgow, Scotland. In their work the pair developed new innovative algebraic techniques, using the theory of ordered semirings to evaluate trust in communication networks, and they successfully applied to systems like the PGP’s Web on Trust and Mobile Adhoc Networks (MANET). Dr. Theodorakopoulos, who graduated in May of 2007 (Dr. Baras was his advisor) is currently a Senior Researcher with the Ecole Polytechnique Federale de Lausanne (EPFL) in Switzerland. The Abraham Prize is awarded annually for the best paper in communications systems, published in the IEEE Journal on Selected Areas in Communications in the previous calendar year. The selection is based on quality, originality, utility, timeliness, clarity of presentation, after wide solicitation of nominations by the Journal Editor-in-Chief from the Editorial Board, guest editors, and readership.